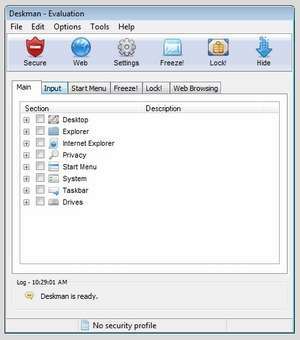 Deskman is a suite of security-related tools for locking down certain aspects of your Windows PC and allowing or disallowing normal users access to sensitive functions. With the free edition, users running Deskman can lock-down their desktop for when they are away from the computer, thereby keeping personal settings, accounts and passwords inaccessible to others. One great example of how to use this software is when you leave your PC to go for lunch; while you're gone, you can make sure your system isn't accessed by employees or colleagues. Version 16.1.2 is a freeware program which does not have restrictions and it's free so it doesn't cost anything. For security reasons, you should also check out the Deskman Free download at LO4D.com which includes virus and malware tests. Additional screenshots of this application download may be available, too.